November 12, 2013, 1:31 p.m.
Last week Toronto Mayor Rob Ford admitted smoking crack cocaine during a “drunken stupor”. Rumours of Ford’s drug use originally surfaced in May this year when news website Gawker appealed for donations to purchase a video reportedly showing the incident. Ford initially denied the allegations but the video is now believed to be in the hands of police investigating his driver for drug and extortion charges. Remarkably Rob Ford’s popularity has increased since the admission and he has refused all calls for him to resign. 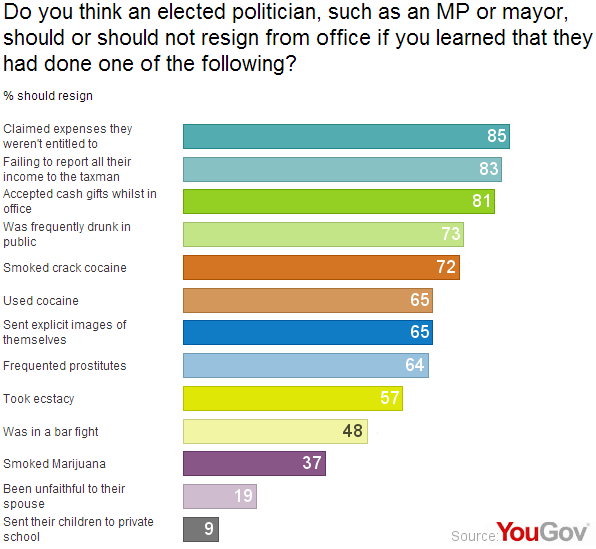 YouGov research shows that Londoners are more likely to demand a resignation over corruption scandals that drug scandals. The top three offences for which politicians should resign all relate to their financial or professional conduct. 85% of Londoners think a politician should resign for falsely claiming expenses, showing public opinion remains unforgiving five years on from the original expenses scandal. This is closely followed by failing to pay taxes (83%) and accepting financial gifts in office (81%). Drug offences tend to come further down the list and the public appear to make a distinction between hard drugs such as crack (72%) and cocaine (65%) and softer drugs like marijuana (37%). Frequenting prostitutes (64%), getting in a bar fight (48%) and being unfaithful to a spouse (19%) are deemed less worthy of resignation than taking crack cocaine. 9% of Londoners think politicians who send their children to public school should resign. London Mayor Boris Johnson has described his past experiences of smoking marijuana as “jolly nice” but now claims to be "illiberal" on drugs. Meanwhile outgoing New York Mayor Michael Bloomberg replied “You bet I did. And I enjoyed it” when asked if he had smoked marijuana. Although unlike Rob Ford&apos;s admission, both were in reference to times long before they came to public office.